A little insight into the world of counseling: Generally in therapy, psychotherapists tend to help and understand people’s concerns, challenges, and symptoms within the contexts of relationships and environments. Typically, the focus of those relationships and environments are explored on a micro-level. 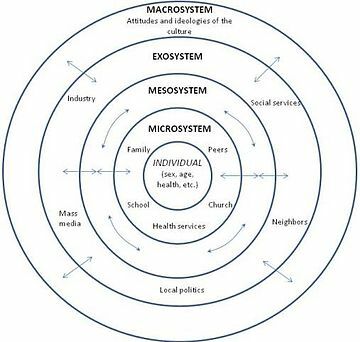 When I say micro-level, I am referring to the inner circles within a concentric circle (an example is Bronfenbreener’s Ecological Theory of Development concentric circle). The innermost circle represents the individual person and everything inherent about this person. The next inner circle represents the more direct people and environments in that person’s life, such as one’s family, friends, work and school peers as well as one’s home, school, or place of work. It is not to say that as therapists we do not explore an individual’s macro-level or larger influential social, economic, and cultural systems, but in general we tend to focus on the more intimate aspects of one’s life in psychotherapy. Today I want to take the time to zoom out and acknowledge the macro systems operating in Chicago and the state of Illinois and its impact on individuals and families. A time to honor Chicagoans and others who may live, work, or attend school in Chicago who are consistently impacted by the long-standing city and state’s financial woes and troubles. As someone who lives, works, and listens to people in Chicago, I understand these can be difficult times for many who are consistently dismayed, frustrated, and down-right angry with our government and politics. It can be hard for some to take time-outs and breaks from the constant chatter, news, and information that circulate and hovers around us. Whether it is a lack of an Illinois state budget, Chicago Public Schools’ (CPS) financial troubles and recent budget cuts, Chicago’s crimes, many services and programs cut, problems within the Chicago Police Department, or the increased cost of living -- the list is long, and the impact is real. These macro-systems affect individuals and families on many levels, including compromised mental health and well-being. If you can relate and find these city and state-wide issues are real to you and impact your emotional and psychological well-being, you are most certainly not alone. Everyone deals and copes in different ways, such as being vocal and advocating for change, getting into decision-making mode with preparing and planning, or internalizing all of it finding a way to distract and escape from it. I encourage you to acknowledge, emote, and talk about the impact of these larger systems on your life, but I also encourage you not to get completely engulfed and swept away in it. It’s not good for your mental health. There is an analogy in mindfulness which encourages people to step behind the waterfall and simply watch and acknowledge its presence and details, but not to jump into it which would lead to a tumultuous ride and possibly and ultimately, one’s demise. Conversely, do not turn your back to it and ignore or deny its reality. If you find that you are feeling the weight of our local news and politics, bringing you down or increasing your anxiety, take a moment to acknowledge, but then step back and shift your attention to something that restores you such as connecting with others, reading a book, connecting to your body with movement or getting into a creative space. After all, we cannot control all of the external happenings in our life, but we can control how we cope and respond. Hope you are able to carve out some 'self-care' time during these times.